A racist Instagram story, featuring the previous statement, ignited outrage and concern on both Wake Forest’s and Winston-Salem State University’s (WSSU) campuses last Friday. Suggesting that a wall be built between Wake Forest and WSSU, a local historically black university (HBCU), the post appeared to reference President Donald Trump’s campaign promise to build a wall on the southern border of the United States, financed by Mexico. 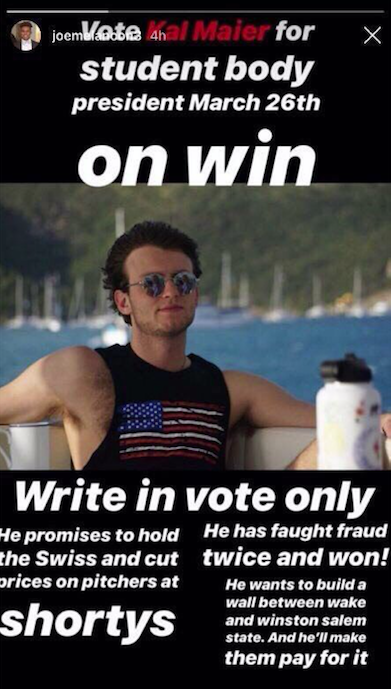 The image, which originally appeared on the Instagram story of a Wake Forest student, endorsed another specific student’s write-in candidacy for Student Government President. However, junior Kal Maier, the student named and pictured in the image, was not an official candidate for Student Government President, nor did he attempt to run a write-in campaign. He said that he had no knowledge or involvement in posting the image. Maier is a member of Wake Forest’s Gamma Phi chapter of Pi Kappa Alpha fraternity. Old Gold & Black reached out to Pi Kappa Alpha’s media team, but they did not immediately respond to requests for comment. The image obtained by Old Gold & Black was screenshotted from the Instagram story of freshman Joe Melancon, who also did not immediately respond to request for comment. President Nathan Hatch stated that a team led by Dean of Students Adam Goldstein is currently investigating the source of the image. On Saturday, Hatch sent an email to the Wake Forest community condemning the post. He noted that he reached out to WSSU Chancellor Elwood Robinson to express his concern. Several students took to Twitter to bring the image to the university’s attention, including senior Bri Reddick, who wrote, “Wake Forest students are rewarded for acts of white supremacy and build entire presidential campaigns off of it. A wall that separates us from a neighboring HBCU [Historically Black College or University] isn’t a platform point, it’s racism.” The official Wake Forest account encouraged Reddick, along with other students who tweeted at the university, to file a bias incident report. Although Reddick said that she did not file a bias incident report herself, an unknown number of students did. The bias incident reporting system does not have any investigative oversight, but instead refers incident reports to other offices such as student conduct and human resources, according to Vice President for Diversity and Inclusion Jose Villalba. Results of the investigation of the image’s origins led by the dean of students will be shared with Hatch. There is no time frame for when outcomes regarding any bias reports filed could be made, and Villalba noted that if it becomes a student conduct case, it would be confidential. Students at both Wake Forest and WSSU expressed anger and resentment at the image, especially as the Wake Forest community reckons with two race-related controversies that occurred earlier this semester: the presence of racist photographs and references, particularly of blackface, in old editions of the Howler and revelations that Dean of Admissions Martha Allman and Associate Dean of Admissions Kevin Pittard, both alumni of the university, appeared in photos in front of a Confederate flag with members of Kappa Alpha Order in the 1980s. Wake Forest School of Divinity student Richard Hughes, a graduate of HBCU Simmons College who also brought the image to the university’s attention on Twitter, said that he first saw the image in a GroupMe and was “not surprised, but disappointed” at its denigration of WSSU. He noted that 59 years ago, in February 1960, 10 white students from Wake Forest joined 11 students from WSSU to protest segregated lunch counters in downtown Winston-Salem. William Gibson, president of WSSU Student Government, also commented on the impact of the image on the relationship between Wake Forest and WSSU to WSSU sophomore Tremane Johnson, a photographer, videographer and interviewer for the university’s newspaper, The News Argus. Johnson, as well as Tori Edwards, the editor-in-chief of The News Argus, agreed to share their reporting with the Old Gold & Black. WSSU senior Christina Harris called on Wake Forest students and WSSU students to come together to have conversations about racism. On Wake Forest’s campus, the image has renewed students’ calls on the university to enforce a zero-tolerance policy for white supremacy. Villalba noted that the university administration recognizes the importance of having a clear statement against white supremacy and that the Office of Diversity and Inclusion is currently considering how such a statement would impact existing campus policies. “These statements, action items and next steps all become part of fulfilling the mission of the Office of Diversity and Inclusion: to facilitate the university’s mission to create a more diverse learning community — a community that can only reach its potential if we all aspire to be more inclusive and more equitable,” Villalba said. 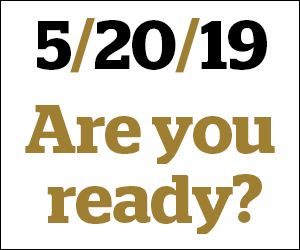 The Wake Forest Anti-Racism Coalition, which formed this semester with a list of nine demands for university policies to combat white supremacy and anti-blackness, also said that the post demonstrates the critical need for a zero-tolerance policy for white supremacy at Wake Forest. The incident was covered by the Winston-Salem Journal and the Associated Press and picked up by The New York Times and the Washington Post. While all three newspapers called the Instagram post “racist,” Hatch’s message to the Wake Forest community did not. Instead, he termed it “offensive.” Cheryl Walker, Wake Forest’s director of News and Communications, said that staff from several offices, including Campus Life, Diversity and Inclusion and Communications and External Relations, informed the wording of the president’s message based on conversations they had with students and what was said on social media.